Whenever we are faced with daunting and seemingly unachievable tasks we try and do the same thing; break it down into manageable parts and take it slow and easy. Eventually bit by bit you whittle away at it and you are closer to achieving your goal......then there are the times you have to jump right in with both feet work like crazy and hope for the best. But let me back up. 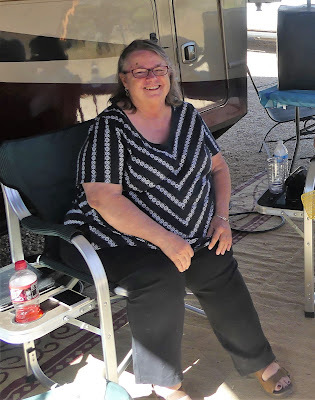 At the end of our last post I mentioned that my sister Carol was going to visit us. We had not seen her since she visited us in Ontario over a year ago so we were looking forward to seeing her again. It was a wonderful week, we loved having her out and showing her our little slice of heaven. We spent the week visiting and getting a few projects done. I was finally able to hang the shed doors, they turned out great! Now I just need to do the other side! 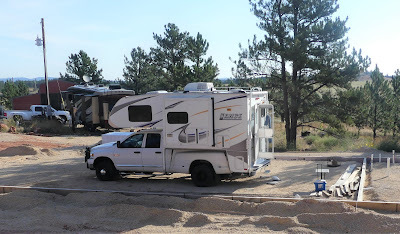 One of the things I was looking forward to was taking her on a jeep ride on the wildlife loop in Custer State Park and then over to Mount Rushmore. 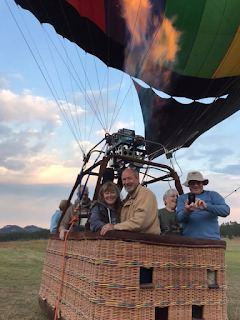 Then one afternoon we got a message from one of Barb’s friends from Wisconsin who was vacationing in Colorado and was coming through the Black Hills on their way home. 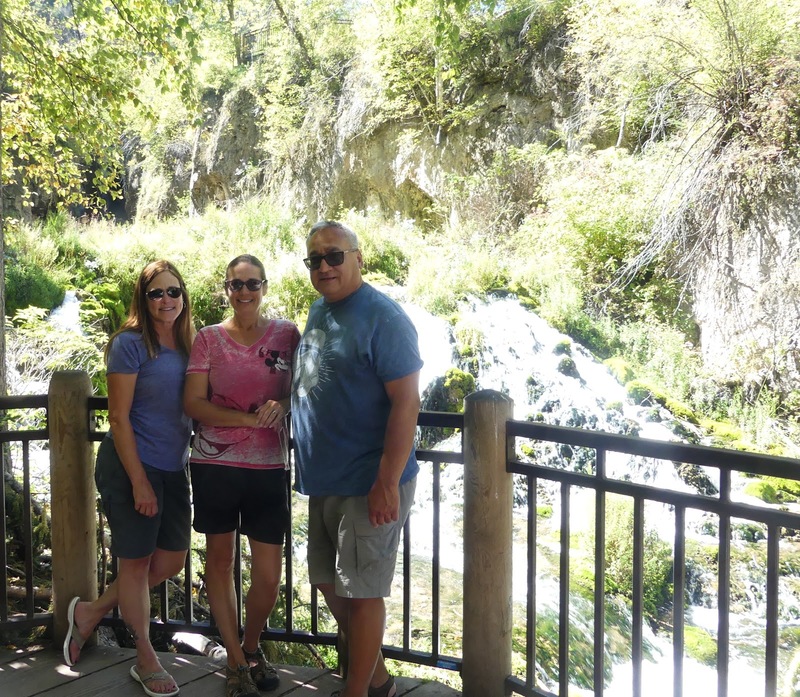 It had been years since we had seen Jim and Melanie and we spent the afternoon catching up and rehashing old adventures. We had a great time and it was fun afternoon. The next day Barb drove 1½ hours north up to Belle Fourche as another one of her Wisconsin friends was there for a barrel race. Barb and Lori used to go to a lot of barrel races together and again had not seen each other in several years. On the way back home she went through Deadwood where she again ran into Jim and Melanie. Coincidence? I think not…..She stopped and had beer with them and watched a reenactment of the Wild Bill Hickcock gunfight. …. and the other was to get the new sign up at their ranch! 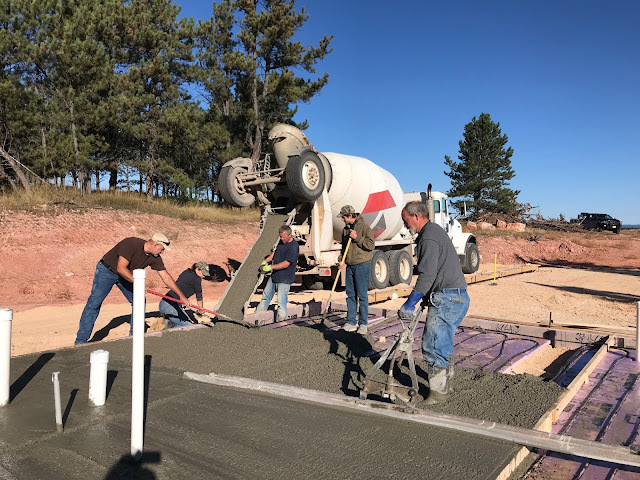 Last time Kevin came out to do concrete he brought his crew out to help. A total of 5 guys who were experienced in concrete work and one guy (me) who had never done it before. This time Kevin had his work cut out for him as it was him, me, Barb and Cheryl. It would be an understatement to say that Kevin was dreading this week but hey, you got to work with what you have! We spent one day getting his site prepped. 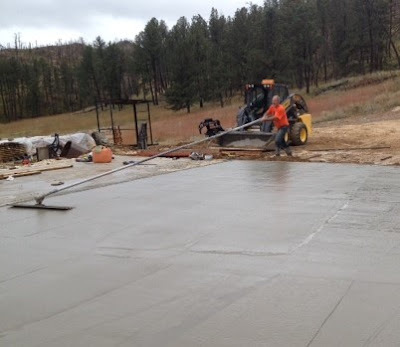 The section we were to pour at Kevin's was 40' x 38' for his garage and horse stall area. 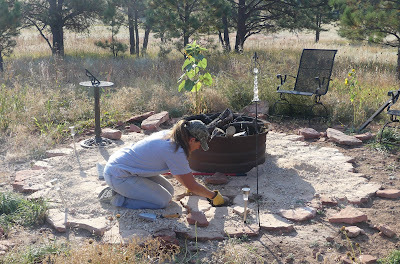 The first step was to put some poly down, lay the rebar and set the leveling stakes. The weather was iffy on the pour day, it started out drizzling and overcast but it was supposed to clear up throughout the day. We called the concrete company to confirm our delivery and they said a lot of people were canceling due to weather. Well, we did not have a choice and just went for it. Looks like a dream concrete crew to me! When the truck arrived, the driver got out looked at the 4 of us and said "Where is the rest of your crew?" When we said, we are it, he had a skeptical look on his face and started putting the chute together. 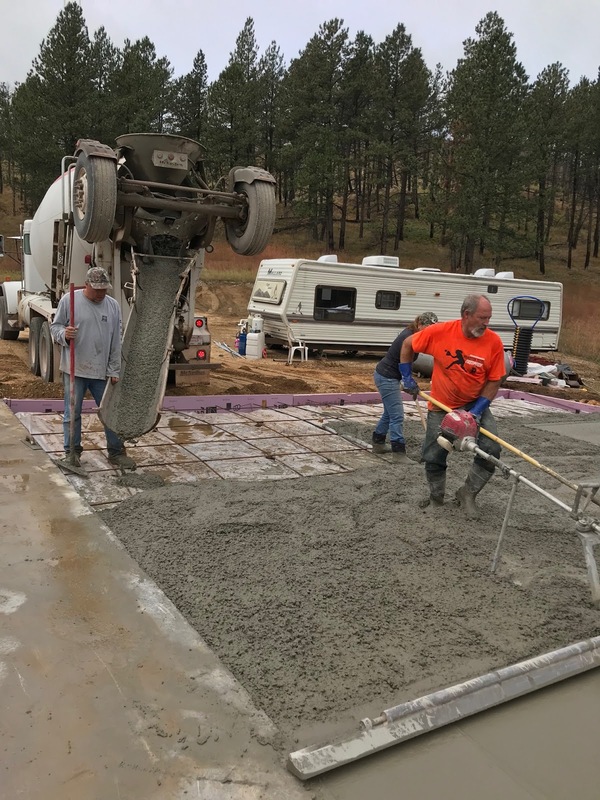 There are basically three jobs while pouring; running the chute, raking and screeding. 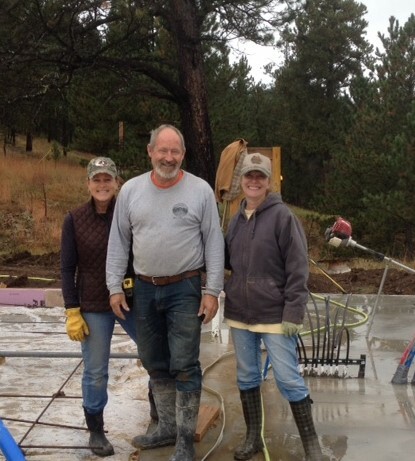 Barb, Cheryl and I took turns with the chute and raking and Kevin did the screeding. During the pour it is an hour of backbreaking work, there is no slowing down, there is no time for conversation, just time to listen to Kevin and follow direction. There was barely enough time to stop and take pictures! 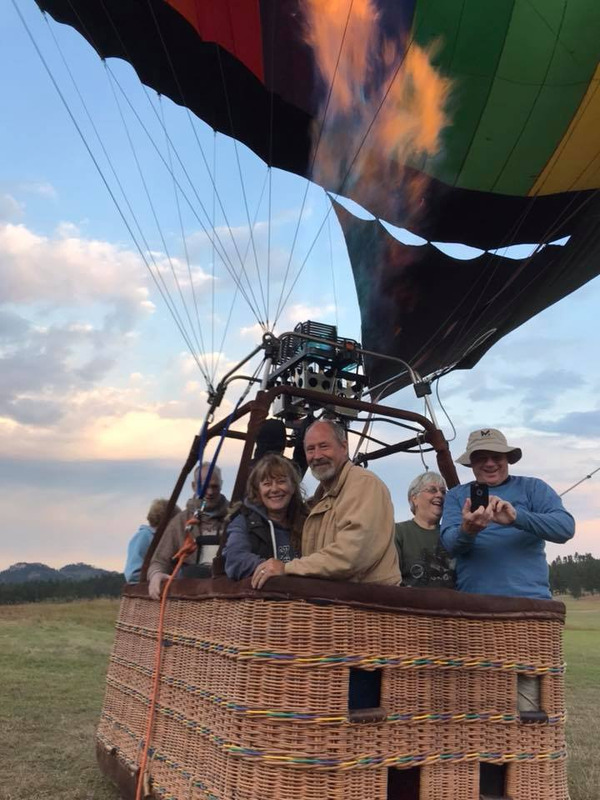 Looks like Barb is doing it all by herself! 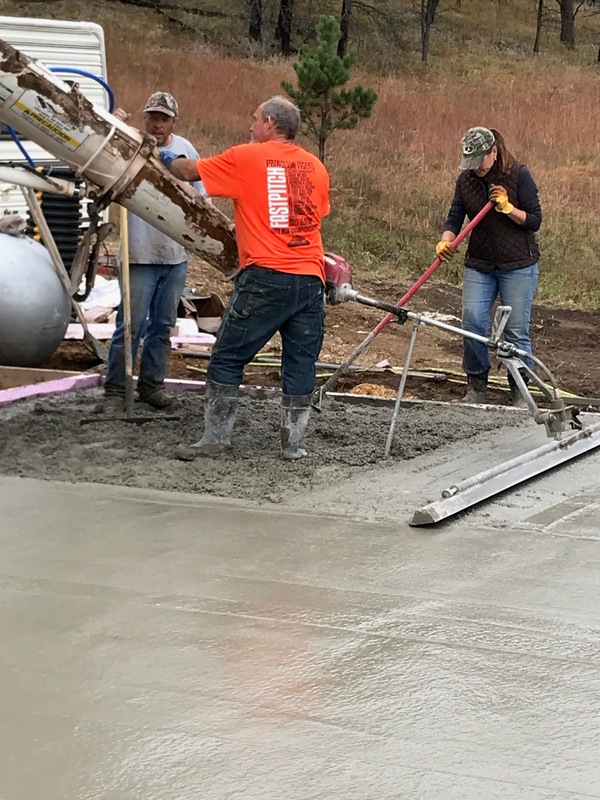 At the end of the pour the driver said he was impressed and that his wife would not even know what end of a shovel to use! Once the concrete is down and the trucks gone the pressure is off..... a little bit. Kevin worked the bull float while the rest of us worked the edges with hand trowels. The last step is to finish the concrete with a power trowel. There are several steps to this and takes over an hour to get it just right. Next up was our place! Our pour was going to be 30' x 38' plus footings for a 30' x 50' garage. 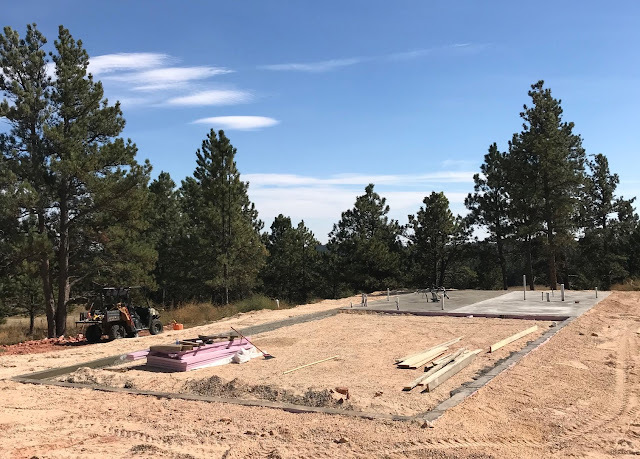 We spent one day getting the rest of the forms down, using the laser level to make sure everything was level, laying the foam under the house section and installing the tubing for the in-floor heat. Foam down and heat tubing in! Because of all the plumbing pipes we had to work around we decided to break the pour into two sections and two days so we ran a form board down the middle. On pour day we again had our dream team along with the help of our neighbor Doug. Luckily there was enough room on both sides of the foundation so the truck was able to drive right down the sides and there was no wheel barrel work! Again, it was intense work but overall it went very smoothly. Today I got a lesson on the power trowel. That helped speed things up so Kevin could move on to finishing around all the pipes. The next day we did the other side as well as the footings around the garage. We again had help from our neighbor Doug as well as another friend, Richard from Hill City. The two extra hands really helped! Before we knew it we were all done. Exhausted but all done! What Kevin was dreading since the inception of the idea did not turn out bad at all. 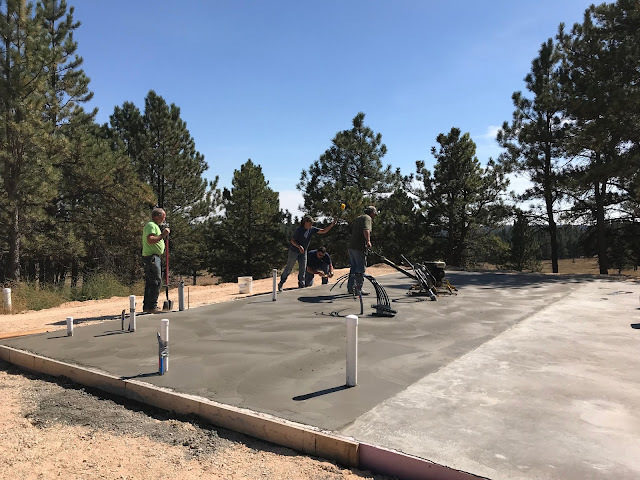 Although there were a few intense moments on each of our parts, he said it could not have gone much better; the weather cooperated, the pours went well and we all remained friends through the entire project. What more could you ask for?!?!? Our goals for this year on our house was to get the concrete down and that in itself was a huge accomplishment. We will concrete the garage at a later date but for now we are just keeping it gravel. Work done, visiting done, deer hunting done, it is time to move on. We are headed north to the farm in North Dakota where the 10 day forecast shows lows in the 20's! Are we nuts? If you know us at all you already know the answer to that one! Good to be Back in the Hills! Upon returning to our property in South Dakota we were greeted with open gates and no prairie dogs (thank you Jordan’s!). It has taken over a year and countless hours but I think they are finally under control. What we found was out of control was the weeds. High weeds were growing throughout our parking area. I am not sure of their real name but tumble weeds had taken over the entire area. They were 2-3’ tall and just as wide. The upside, if there is one, is that they are easy to pull and have a single root so we had them pulled in short order and were settled in our spot for the next 4 weeks. The downside, Dakota was running and got a weed seed in her eye. As a result she went around for about a week looking like a pirate. A week of saline and suave and she was as good as new. 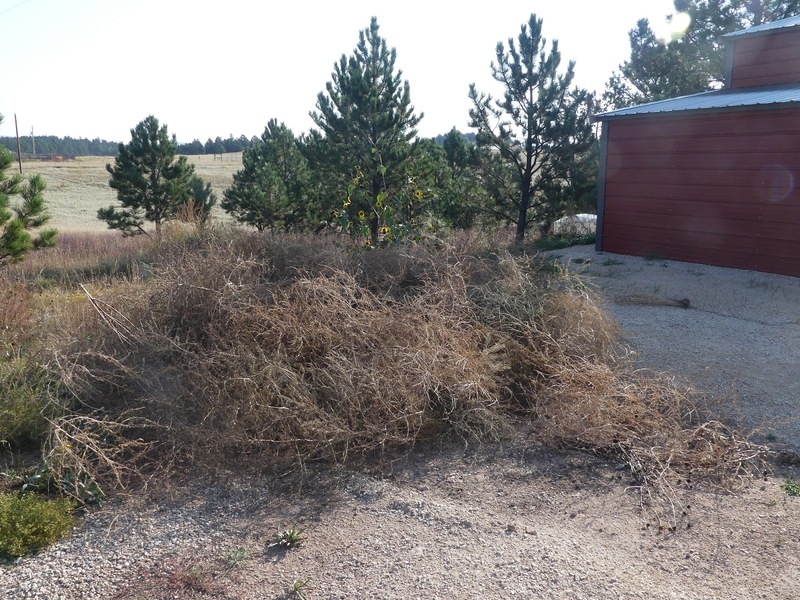 Some of the many tumble weeds that were awaiting us! 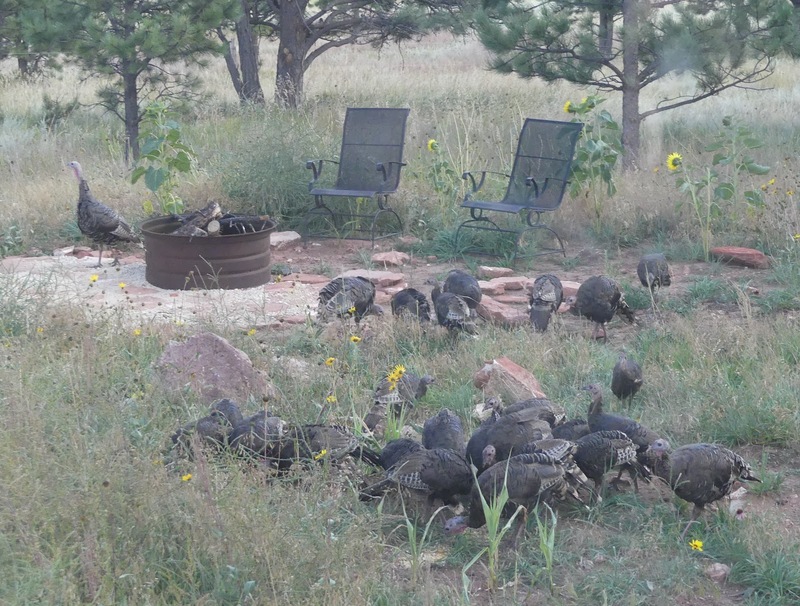 Even the turkeys were happy to see us return! We have a mix of work, play and visitors planned over the next 4 weeks with lots to fit in. First up was visitors and play. 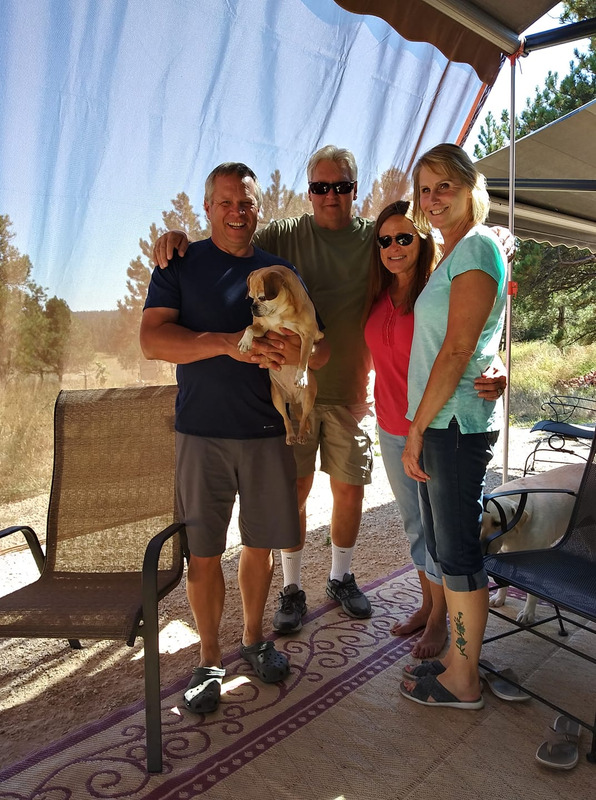 Good friends and fellow travelers Tango and Gladys (a.k.a.Dino and Lisa) stopped by for a few days showing off their new cabin on wheels. Their regular home is a 2014 Cardinal 5th wheel but being rich folks like they are, they decided that wanted a cabin as well so they went and bought a Lance pick up camper and decided to make a quick run down to see us to test it out. It is a great camper and similar to the one we are looking at for our next Alaskan adventure. 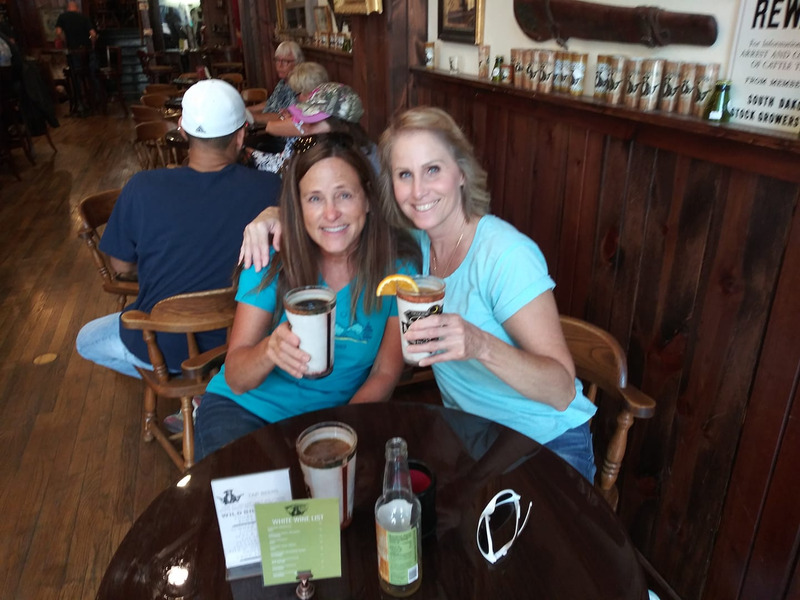 We spent one afternoon touring the city of Custer going in and out of almost every store on main street. 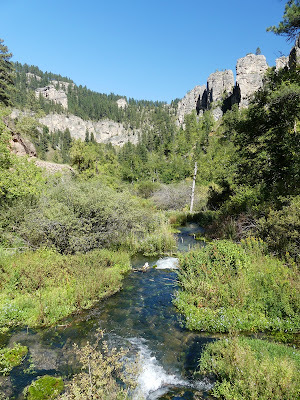 Another afternoon we took a road trip through Spearfish Canyon and actually got Dino on a hike! We had been saving this hike escpecially for when Dino and Lisa visited as it is only a little over a mile long as we cannot go too far due to Dino’s “condition”. 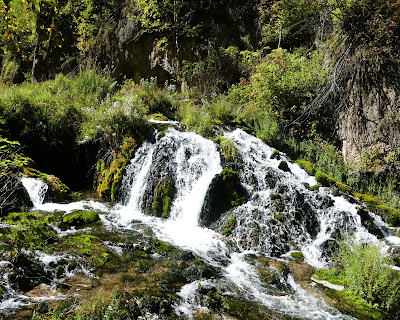 It wasn't until later we discovered that they had already been on that hike…. 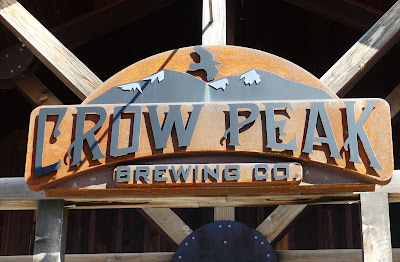 Oh well, all was not lost, at least we were near one of the breweries we still had not been to in the hills! Their visit coincided with the opener of the archery deer season and as good of friends as they are, you don’t get in the way of deer opener! I think they were amazed/disgusted at the lengths deer hunters go to in order to get within bow range of these wily critters. 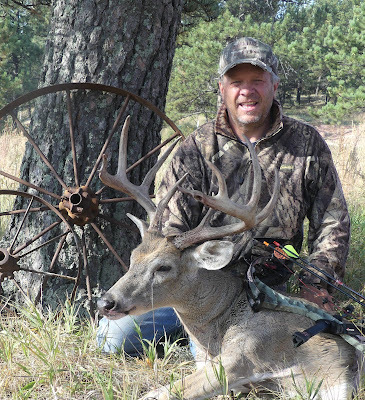 Over the years I have gone from getting “a” to getting “the” deer within bow range. 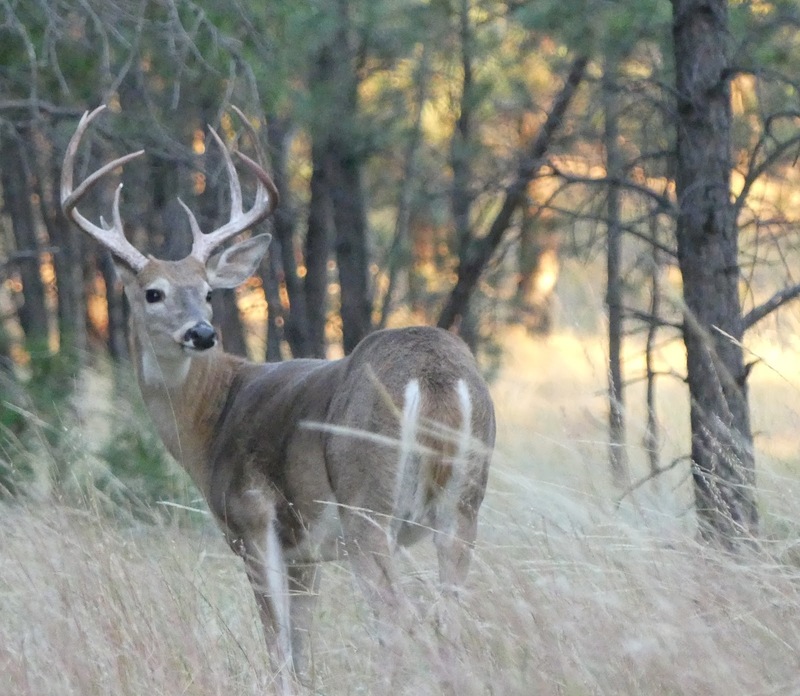 The three primary senses of deer are sight, hearing and scent. If you conceal yourself and stay quiet you can usually overcome the first two, the sense of smell however it the hardest to overcome. Making sure you are positioned downwind of where you think the deer will come is the first rule but I think I lost Dino and Lisa with the rest of my preparation. Washing my clothes in scent free detergent, showering with scent free soap/shampoo both make sense. But when I pulled out the fox and deer urine Lisa looked at me like I was crazy. “You put that on?” she asked? “Sure, just a dab behind each ear and the deer come runn’in!” Actually you use it on the surrounding ground to cover any remaining scent you may have in the area. Both Dino and Lisa just stood there scratching their heads probably wondering how you get it from the fox or deer into that bottle. Which brings me to our funniest moment of the week..... Barb was doing laundry in Custer and came across a bottle of fox urine in the pocket of my jeans. She put it on top of one of the washers and the owner walked over picked it up thinking it was some Essential Oil and smelled it before Barb could say anything. Barb was mortified and the owner did not talk to her the rest of her visit! 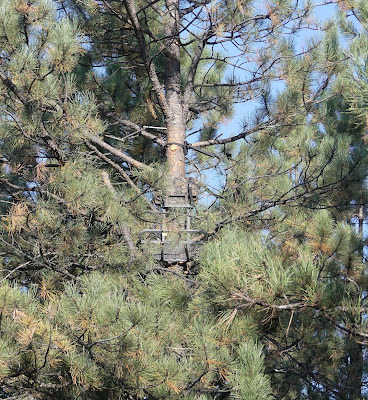 Can you see my tree stand up there? 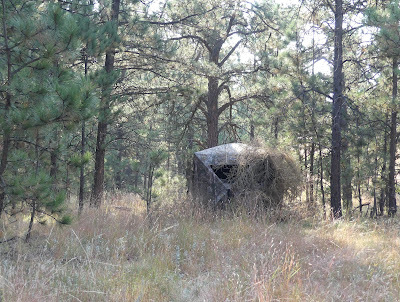 Opening morning arrived and I snuck out of the camper at 4:30am wanting to get into the woods well before sunrise. Over the next two days I spent 16 hours either in a blind or in a tree and saw lots of deer but not the deer. It is therapeutic just being out in the woods, watching the wildlife, listening to the wind in the pines and plus I had my camera with me (on silent mode) and was getting some great shots. On the morning of the third day I was again out an hour before sunrise and had seen several deer but not the big guy. That all changed within minutes when to my left side a deer walks into view and it is him! 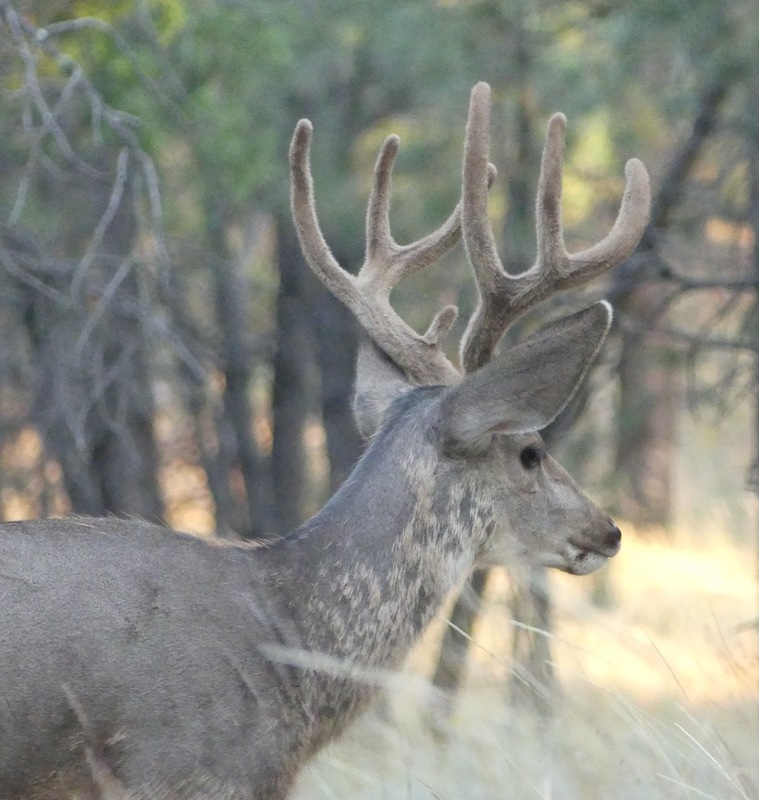 It is amazing how calm I can be watching all these deer but when this one showed up my heartrate went through the roof! I carefully picked up my bow and waited for the right shot…. 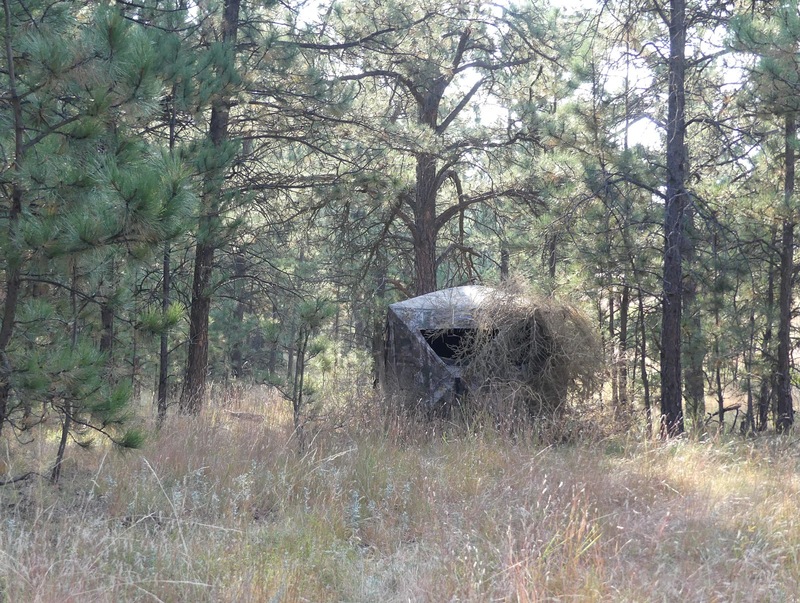 As he turned broadside I started to draw back my bow when the slightest of creaks came from the chair I was sitting in. All I saw from that point was a white tail as he bounded away. Dejected I packed up and headed in for the morning. That afternoon I went out to a different spot thinking the big guy would steer clear of the spot with weird creaking noises. 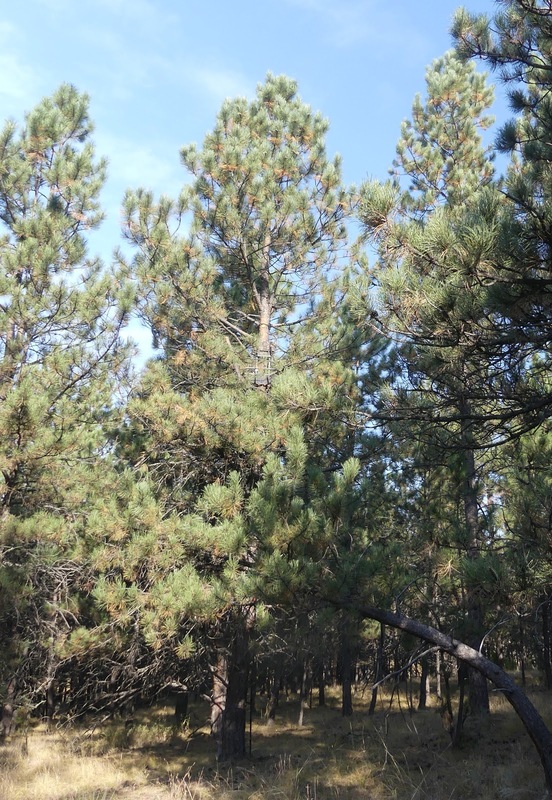 About 7:00pm I heard something approaching from behind me and I could see a deer with antlers walking through the pines. When it got to an opening I could see it was him! He walked directly under my tree and this time I was able to draw back without making any noise. 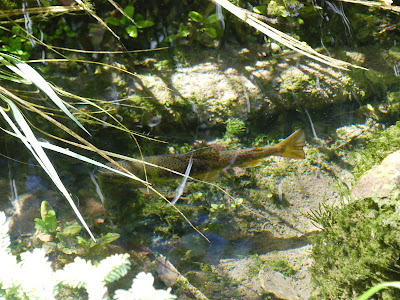 Minutes later I was standing over him feeling a cacophony of emotions; elation, excitement, respect and sadness. That is part of hunting and for the second year in a row I had harvested a trophy buck on our property! For those of you who want to see a picture it is at the end of this post, for those who want to pass, skip the last picture. Unfortunately Dino and Lisa had left that morning and were not there to see him. Our most traumatic event of the week occurred while we were having happy hour over at our place with the Jordan's. We were outside our rig having a beer(s) enjoying a quiet evening when a goldfinch landed on a sunflower plant just a few feet from us. We all sat there watching the little bird thinking how cool it was to have it so close when all of a sudden out of no where a hawk swoops in and snatches the goldfinch off the flower without missing a beat. We all just sat there stunned looking at the empty flower. "Did that really just happen?" Hunting complete, it was time to get to work. Barb is continuing to work on the stone around our fire area. It is a big project but she is making good progress! My project for the week was building a set of barn doors for our shed. We went to a local saw mill and picked up (10) 1x10 and (10) 1x4 rough cut boards. I had to special order the hinges and am still awaiting their arrival but the doors are done and ready for installation. You will have to wait until next week to see the finished product! This coming week is again filled with visitors and projects as my sister Carol is arriving and we are getting ready to pour concrete! Stay tuned!